Bernard Madoff's lawyers have appealed his jailing, saying he should be released until sentencing because he never fled, even knowing he could expect to die in prison. Madoff's lawyers filed papers with a federal appeals court Friday. The disgraced money manager pleaded guilty Thursday to 11 felony counts, including securities fraud, in what may be the biggest fraud in Wall Street history. His $10 million bail was immediately revoked. His lawyers also say they need to consult with Madoff to prepare for his June 16 sentencing, and his jailing makes that difficult. At Madoff's plea hearing yesterday, defense attorney Ira Sorkin argued Madoff deserved to stay out because other high-profile financial criminals accused in multi-billion-dollar frauds were not jailed until sentencing, but Chin disagreed, telling prosecutors he did not even need to hear their bail arguments. "In light of Mr. Madoff's age, he has an incentive to flee, he has the means to flee, and thus, he presents a risk of flight," Chin said. A federal appeals court will hear the bail appeal Thursday. Madoff woke up today in a 7 1/2 by 8 foot jail cell as Prisoner 61727-054 at the Metropolitan Correctional Center in lower Manhattan, reports CBS News chief investigative correspondent Armen Keteyian. And whatever the outcome of his bail status appeal, he'll soon be on his way to much harder time in prison, following his June 16 sentencing. "Once Madoff goes to a federal penitentiary, it's going to be serious," said CBS News legal affairs analyst Andrew Cohen "It's not going to be luxurious." While nothing is set in stone, CBS News has learned it's unlikely that Madoff will be sent to a maximum security federal prison, as many of his victims have called for. Instead he'll likely go to a medium security prison within 500 miles of his New York home. One like Otisville in upstate New York or Allenwood in Pennsylvania. Not exactly the Big House, but a far cry from a $7 million Manhattan penthouse, a life of luxury and privilege. "I've been in minimum security," said Larry Levine, a former federal inmate who runs Wall Street Prison Consultants, helping convicts to adapt to prison life and try to reduce their sentences. "I was at the one in Phoenix. And they're dangerous places." Meanwhile, investigators say they have their work cut out for them identifying who else may have been involved in Madoff's nearly $65 billion scam. Among other things, prosecutors must determine what role, if any, Madoff's wife, brother, two sons and employees played in perhaps the largest Ponzi, or pyramid, scheme in history. "A lot of resources and effort are being expended, both to find assets and to find anyone else who may be responsible for this fraud," federal prosecutor Marc Litt said at a hearing Thursday where Madoff pleaded guilty to 11 felony counts and was ordered to jail immediately. Authorities also will have to reconcile Madoff's statement to the judge that "to the best of my recollection, my fraud began in the early 1990s." Prosecutors have alleged that the swindle began in the 1980s. As for how he helped sell his scam to victims, CBSNews.com's Ken Millstone writes, "According to charging documents, Madoff pitched investors a strategy he called 'split strike conversion' that involved investing in a basket of 35-50 stocks from the S&P 100 (the 100 largest publicly-traded companies in the United States). He promised to 'opportunistically time' his purchases and he said he was pulling out of the market occasionally and rolling the money into Treasury notes." Even though he admitted that his investment advisory business was crooked, Madoff insisted to U.S. District Judge Denny Chin that the other businesses his firm engaged in - those run by his brother and two sons - "were legitimate, profitable and successful in all respects." After Madoff's statement, Assistant U.S. Attorney Marc Litt told Chin the government "does not entirely agree" with Madoff's description of the crime and went on to say, "At times, his firm would have been unable to operate but for the cash generated from this Ponzi scheme." 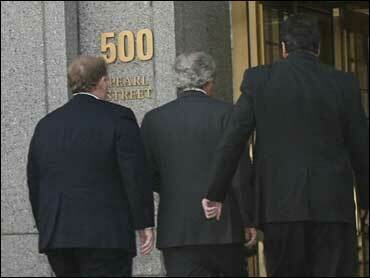 Madoff's wife, Ruth; brother, Peter; and sons, Mark and Andrew; have not been accused of any wrongdoing. But unhappy investors who lost their fortunes with Madoff believe others were involved. George Nierenberg, who was one of three investors who spoke at the hearing, told the judge he believed that Madoff "didn't commit these crimes alone." "Just to produce the reams of documents that were received and the elaborate data that went into them must have required an army of people to produce," he said. "And we all know that Madoff wasn't around a lot at his operation." Still, investors welcomed the swift turn in fortune for the 70-year-old money manager, who in one fell swoop went from living in a $7 million penthouse in midtown Manhattan to a tiny jail cell with cinderblock walls and linoleum floors. Angry investors packed the federal courtroom to watch Madoff plead guilty to cheating nearly 5,000 investors out of billions of dollars and apologize to his victims. "I cannot adequately express how sorry I am for what I have done," Madoff said just before Chin ordered him to prison to await a June 16 sentencing when he will face up to 150 years in prison. Defense attorney Ira Sorkin argued Madoff deserved to stay out because other high-profile financial criminals accused in multi-billion-dollar frauds were not jailed until sentencing, but Chin disagreed, telling prosecutors he did not even need to hear their bail arguments. Madoff's lawyers immediately appealed the order to jail Madoff pending sentencing. In addition to prison time, he could also be fined and ordered to pay restitution to his victims and forfeit any ill-gotten gains. In his long, detailed statement delivered in a soft but steady voice, Madoff implicated no one but himself. He said he started the vast pyramid scheme as a short-term way to weather the early-1990s recession, and was unable to extricate himself as the years passed. His Dec. 11 arrest turned a well-respected investment professional - Madoff was once chairman of the Nasdaq exchange - into a symbol of Wall Street greed amid the economic meltdown. The public fury toward him was so great that he sometimes wore a bulletproof vest to court. Because Madoff pleaded guilty without a deal with prosecutors, he is under no obligation to cooperate. Some legal experts and investors have speculated that he is sacrificing himself to protect his wife, his family and friends. In a statement, Acting U.S. Attorney Lev Dassin said the government made no deal with Madoff concerning his plea, his sentence or the possibility of additional charges being filed against Madoff or others. In court documents, prosecutors say Madoff reported he oversaw $64.8 billion. However, experts said that the actual loss was probably much less and that the higher number reflects the false profits Madoff told investors they were making. So far, authorities have located only about $1 billion for investors. His thousands of victims included individuals, trusts, pension funds, hedge funds and nonprofit organizations. The scheme wiped out people's fortunes, ruined charities and foundations, and apparently pushed at least two investors to commit suicide. Investors big and small were swindled, from Florida retirees to celebrities such as Steven Spielberg, actor Kevin Bacon and Hall of Fame pitcher Sandy Koufax and Nobel Peace Prize winner and Holocaust survivor Elie Wiesel.